If Dairy Queen taught me anything, it was, first and foremost, that I am a horrible read-along buddy. Seriously. I was only supposed to read five chapters of this today and I wound up reading all twelve chapters until the end, reading in the hallways, through classes, and on the bus ride back home. Needless to say, it was a little hard for me to put this book down after a point and even now, I can't get it out of my head. 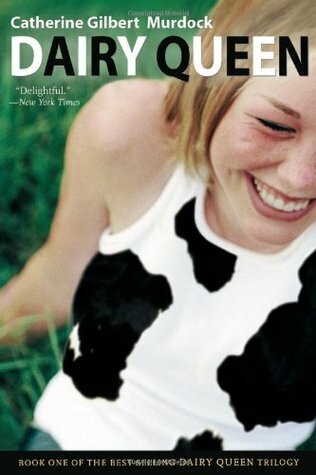 Dairy Queen is everything you wish for in a contemporary novel and so much more. It's original. Yes,original! You'd think in a genre dominated by Ruby Oliver and Jessica Darling that we couldn't possibly get another lively, spunky, and heart-warming heroine to join the two, but DJ Shwenk makes a niche for herself. Yes! I love D.J. so much, I'm thrilled that she found another fan. I know what you mean, it's difficult to pinpoint exactly WHAT is so unusual and amazing about her, but she is so easy to love and admire. She can be a book character or someone living just down the street, that's how real and natural she seems. I think what helps is that Murdoch is truly an extraordinary writer, with those clean, neat sentences and good sense of pacing. Anyway, I'm so happy you enjoyed this! You'll love the other books too. Btw, I'm a horrible readalong partner too. :( Go us. And this really does sound fantastic, I love books that make me inspect my own life and DJ sounds like a great girl! You keep coming up with reviews for books that are completely new to me Keertana, I love it! Or, possibly, I'm just out of the loop and everyone else is aware of these books and I just have my head stuck in the sand like a champ:) I've been on a contemporary roll lately, so I'm definitely adding this one to my list - it's obviously way more complex and layered than it's simple cover suggests! This sounds fantastic! I hadn't even heard of this book or its author until I saw you and the others reading it. It's the sort of contemporary tale I actually enjoy so I definitely need to read this one day. Fantastic review as always, hon! P.S. I love your new title design/art! It's so lovely! I had this one recommended not so long ago so its on my wishlist. I love Jessica Darling so a character as slinky as her appeals to me very much. Your review has me thinking I may not be able to wait too much longer for this one! Keertana, darling, you know I love you dearly, but you are going to have to stop doing this. Reading good books that I've never heard of because you make me want to read them too. haha. Especially when I can't get ahold of the book or they aren't in kindle format, the only type of books my mother will allow me to buy these days. All things considered, Dairy Queen is another book on my wishlist and thank you for the wonderful review!! Never fear, Keertana, you are a TERRIFIC read along buddy! Honestly the best person to get into long - winded but fascinating, thought-provoking discussions with whilst reading books. I'm so glad you read this with Jasprit and I! And your review is absolutely perfect, btw. You pinpointed exactly what I loved about this book. :) It's quite an addictive series so I know I'll be reading the sequel soon! This series sounds so sweet and charming, and YES, like it could fit on a shelf beside Jessica Darling and Ruby Oliver. As a country girl, I'd probably really dig the farm aspect as well. Though I have to be honest, I think I've kind of grown out of these types of contemps. It's not that they're not great reads, it's just that I'm *gasp* too old to really appreciate them the way I would have in high school. BUT if the contemp urge strikes, I do want to keep this one on my mind. Great review, Keertana! I love this little book with the big heart so much too, Keertana! I happened upon it a my local library last year (or maybe the year before)and though I haven't reviewed it, I just LOVED it. I loved DJ, everything about her, her humor and her heart, she is one of the most likable YA protag's I have ever encountered. I agree, this little book doesn't get the press it deserves, it's a real gem. Your review made me want to read it again and then pick up my copy of The Off Season and read it.Great review!